How to get it done? That’s a longer tale. We do not want to lose sight of the reality that the Civil 3D 2018.1 Rehab Tools are fundamentally both analytical and iterative. The concept here - beyond the code - is to evolve a practical and workable design solution quicker. We will soon discover that some of the other new Civil 3D 2018 features like Connecting Alignments will come to our rescue given the limitations of the dynamic Rehab Assemblies and 2018.1 Rehab tools. This use of Connecting Alignments in Rehab Intersection corridors might be unexpected and a welcome surprise. This Connecting Alignments trick has many more potential Civil 3D 2018 corridor design workflow applications. Maybe you missed that? Please, try to resist banging your head onto the keyboard. In our previous posts in this series about the Civil 3D 2018.1 Rehab tools we’ve explored the depth and detailed mechanics. With access to all the posts, example videos, and our Framework for Civil sample project dataset you should be able to quickly learn the Civil 3D skills to put the Rehab tools to work. Links at the bottom of the page. In our first post we explored the basic setup essentials and built a basic Rehab corridor quickly from raw Survey data. A neat trick. In our second post we extended to problem to multiple lane projects and multiple Baseline corridors. We employ the Rehab tools to tackle the classic half-street or by-lane project. Our third post chewed over the different edit mechanics of Rehab Assemblies and Rehab Corridors is lots of detail. WTMI, but the details come back to bite you. Rehab Regions and the dynamic Assemblies have built-in evaluation controls constructed around Ideal Cross Slope. In our fourth post we explored the vagaries of Rehab Cross Slope Control including calculated Superelevation used with the Rehab tools cross slope control. You can probably employ the trick of a manually built Superelevation table (even on tangent Alignment segments) to force specific Cross Slope design conformance. This may be an important tip in developing your Rehab Intersection designs. I strongly recommend you employ the Rehab Tools in simpler initial scenarios first before tackling complex intersections with multiple Baselines and multiple Rehab Regions with dynamic Rehab Assemblies at work. Time to discover the intersection or Rehab and complex corridors with our brains engaged. Time to learn some Civil 3D skills with thrills. We may want employ the Intersection Wizard to establish the horizontal control, vertical control, and the basic region structure for a Rehab intersection. If we have lane widenings and other design modifications needs in the rehab or reconstruction project the design by Intersection approach makes more sense. We could construct the entire multiple Baseline Corridor and all other required Region parts and various control pieces separately. The Civil 3D 2018 slope-controlled Offset Profiles and Connecting Alignment and Profiles help reduce the manual control setup significantly. That may be way too much busy work. The raw Intersection Wizard tool isn’t going to do exactly what we want. It will get us to an 80% solution faster. We just replace the parts and specifics and fine tune the Rehab corridor design. The design analytic methodology and workflow is iterative…Imagine that. I won’t repeat the need and Stop the Intersection wizard method employed to initially to build the managed horizontal control we will need for the project. You may have multiple Intersections, multiple Cascade Intersections, and other design details to sort out. See the Intersections and Corridors page for videos and links to the mechanics. The Members section (requires a login) Documentation and Help has lots of Civil 3D help on Intersections and Corridors and the infamous Book of Alignments. Register here for free. 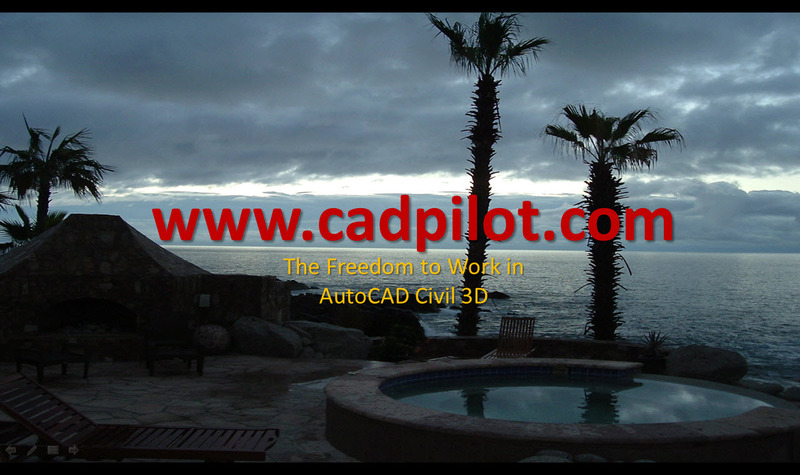 The key Civil 3D Intersection Wizard post with video is Stop That Civil 3D Wizard. In the example we employ the ETW as the control. You might want consider that control to be a pavement cut line for practical purposes if you’re improvement project includes widenings and/or replacement subassemblies. In the video we also review the prebuilt the Offset Alignments and Offset Profiles for the Intersection Wizard. It always helps to understand what a Civil 3D tool eats. Without much fanfare Autodesk updated the Intersection Wizard in Civil 3D 2018 to include the employ the new Offset Profile functionality. In general, this is good news. If you have older project with Alignments built with Station constrained geometry and/or partial Profiles with Station locked geometry, you may find Civil 3D 2018 will fail to automatically build proper Offset Profiles. Put another way - if you employ one Alignment with multiple partial Profiles to handle separate Intersections related to that same Alignment, you may need to employ separate design Alignments or modified full Profiles to work around Civil 3D 2018’s current failure to launch issues with partial Offset Profile creation. Bottom line - Check your Offset Profiles. Essentially, we built a prototype Intersection to become a framework for the Rehab Intersection. Obviously, the initial Primary Alignment choice of Intersection Slope control type matters to the end design solution. The Intersection Wizard reduces the time to needed to construct all the multiple Baselines and Regions and provides us the framework to produce widening control if needed. We replace the Assembly Set supplied Assemblies in a prototype Intersection built corridor with dynamic Rehab Assemblies. We are probably better off constructing the Rehab Assemblies manually before and/or developing a core one or two with the required Rehab Subassembly Parameter details prior to performing the Region Assembly replacements. You should work from a control plan. Know thy targets. The Rehab subassemblies expect a surface target. You will get no visible results in the Rehab corridor if you get the targeting wrong. This is a good news bad news result. Adjusting the dynamic Rehab Assembly targeting in the Rehab Corridor Regions is tedious. Never assume the Rehab Parameters are set and applied as advertised until you check. There’s a good reason a Connecting Alignment is typed as a Curb Return Alignment. We show in the video you may want to attack a simple intersection repave project this way from the get go. Build new Civil 3D 2018 Connecting Alignments with dynamic Profiles to replace the control for the classic Curb Return Regions in the prototype Intersection. The Rehab subassemblies work inside out with negative Ideal Cross Slope Control parameters. In other words - create Connecting Alignments between the two main Intersection Alignments with a reasonable radius. The direction of the created Connecting Alignment matters. You cannot currently change the order of a Connecting Alignment after creation. The Connecting Alignment radius value is adjustable after creation. The radius value will effect both the existing surface slope assessment and the Region stationing. The default dynamic Profile of a Connecting Alignments is an approximated Parabolic unlike the default tangent solution for an Intersection Curb Return Alignment. The dynamic Rehab Assembly for the Connecting Alignment Regions will have both left and right Rehab Lane subassemblies. The Rehab double-sided Crown subassemblies will generally not work in this scenario. One side will find the ETW with Ideal Cross Slope Control evaluated and applied. The opposite Rehab subassembly might be best set to the Match Slope method and target the main Alignments. You should probably not start here, but it helps to understand that more fine-grained assessment and control is available. Remember that multiple Lanes defined in the Rehab Lane subassembly mean you can have multiple sampled areas within the applied subassembly. Multiple Rehab lanes may help refine the surface assessment and final solution whether or not you actually have physical design multiple lane conditions. Surfaces with rutting conditions in turn lanes areas comes to mind. You can assume you will have to Adjust, Delete, and/or Add/Split regions in the prototype Intersection corridor. The radius value(s) of the Connecting Alignment(s) will affect the Region stationing. The stationing of Corridor Curb Return Regions will always require adjustments due to the change of the core horizontal control and new Rehab Assembly insertion requirements and parameters. Additional manually added Frequency sections will likely be necessary to fine tune the resolved regions in the corridor. EOV Feature lines at Region boundaries clarify the existence of issues. Recall that the Overlay Slope Correction Report will allow you to Section Edit the applied Slope at individual stations as a last resort to Region edge conditions. Alignment QAQC Style tools that helpfully display key nodes in the horizontal Alignment control help a lot. Code Set Styles that resolve what you need to see in both Plan and Section are more than essential. The Framework for Civil 3D includes these rich design-time Civil 3D style tools and many more user-friendly resources. Release 7 2018 customers – Please don’t miss the recent new and free Subassembly 2018.1 AddOn that includes improved Styles for the new Rehab subassemblies. Get the download.